Each year a staggering amount of paper waste ends up in our landfills from undeliverable as addressed mail. 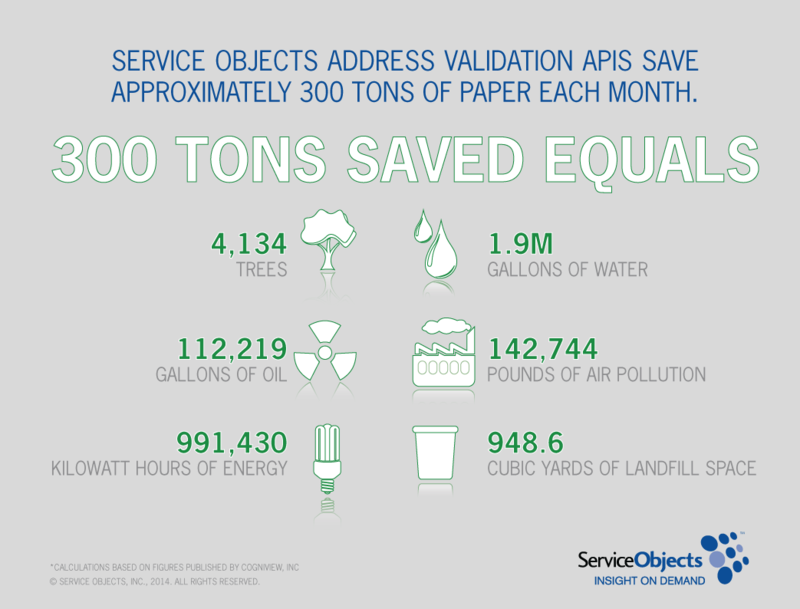 Service Objects suite of Address Validation APIs save approximately 300 tons of paper from entering our landfills each month. Service Objects is committed to reducing waste in paper, time, and money, not just on Earth Day, but every day of the year. All of our real-time web services are designed to deliver the highest quality data so that you can get your job done and in the process, reduce the amount of waste generated from data inaccuracies. While you’re saving your company time, money, and resources by integrating the most reliable data validation APIs from Service Objects, know that you’re doing your part to help the environment.